We are delighted to have a wide selection of Duncan Palmar’s stunning original oil paintings of local beaches throughout December with Duncan appearing in the gallery from Friday 4th to Saturday 5th December. We will also be arranging commissions for customers who wish to have their favourite beach or coastal view depicted by Duncan. This truly is a marvellous way to take your special memories of Cornwall home with you ! 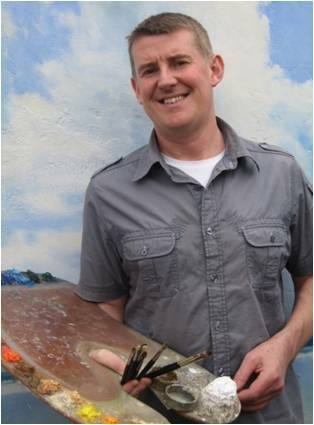 Duncan started painting professionally from the age of 19 and continues to attract collectors who appreciate fine oil and watercolour paintings. Inspired by the Newlyn School of Artists who worked in Cornwall in the last century his distinctive representational style captures texture, light and atmosphere in his landscapes and coastal scenes. He successfully applies the same principles in his treatment and composition of the interplay of light that those artists achieved in their paintings. 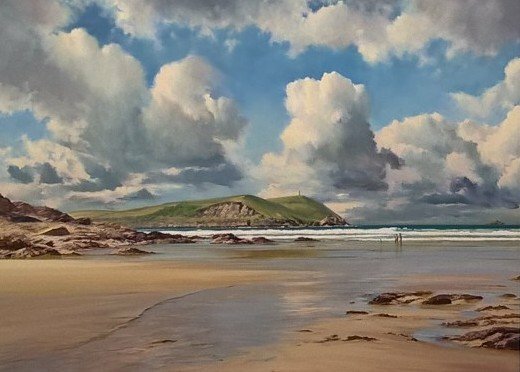 Duncan’s magical coastal scenes evoke memories of the sand between your toes and have become a firm favourite in the gallery. We are delighted that he is able to join us so that customers and collectors have the opportunity to meet and discuss the inspiration behind his work. Sign up to our enewsletter As The Paint Dries for the latest news and details about this event. Previous PostJJ Adams – Surgery CollectionNext PostSatava – Stunning Jellyfish !